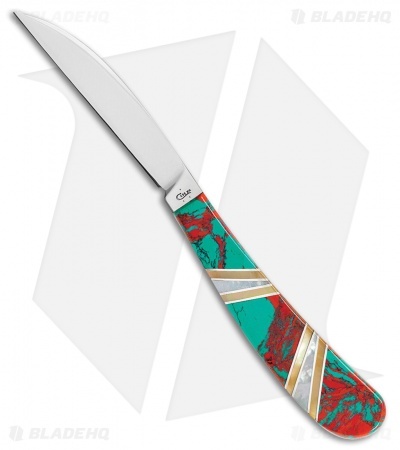 Part of the Exotic Stone Series, the Case Exotic Sonora Sunset Desk Knife Crimson Cuprite scaled pocket knife is sure to be a favorite in any collection. Bright red Cuprite with blue green Chrysocolla inclusions make each knife one of a kind. Mother of Pearl, brass and nickel accents the Sonora Sunset Crimson Cuprite. 154-CM stainless steel blade with polished nickel silver bolsters ensures years of enjoyment. Expertly crafted and presented in a velvet keepsake box, the Sonora Sunset knives will be a jewel your collection.